I’ve been to this coffee shop before. It’s only a five minute walk from my apartment. 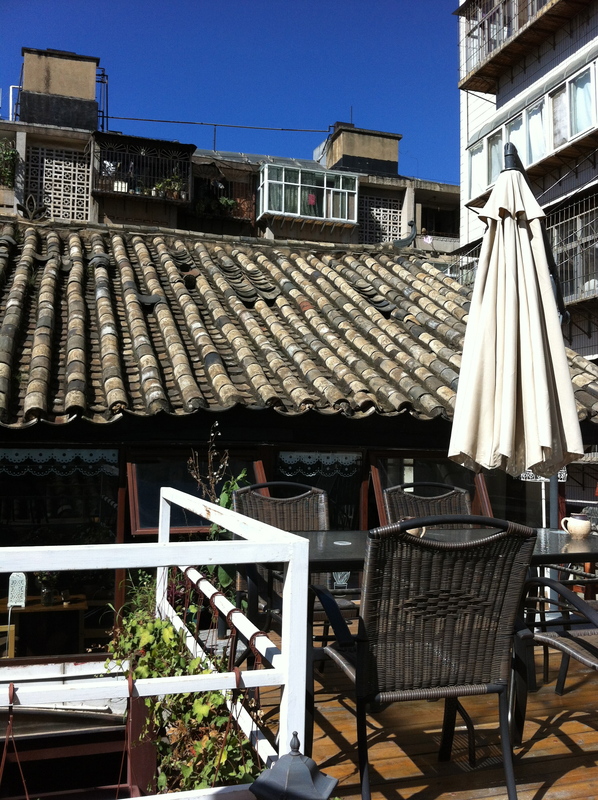 But today, while sitting on the rooftop terrace overlooking the cracking and aged Chinese roof, enjoying the blue sky and an iced Americano, it felt like the most amazing place in the entire city. I’ll be going back here a lot more often before the weather gets too chilly to sit outside. Perfectly blue sky with plenty of sunshine– just how I like it! It got a little windy and some the umbrellas were blowing pretty violently… Maybe a little less wind would have been good. I’m scared to tell too many people about this place, because as you can see, it was my little secret today! There were only two or three other people sitting outside. More space for me! Feng hen da. Is that the saying? And the reason for the blue skys? Is the coffee expensive? Maybe that keeps many people away? Yes! 风很大 (feng hen da)= the wind is big! 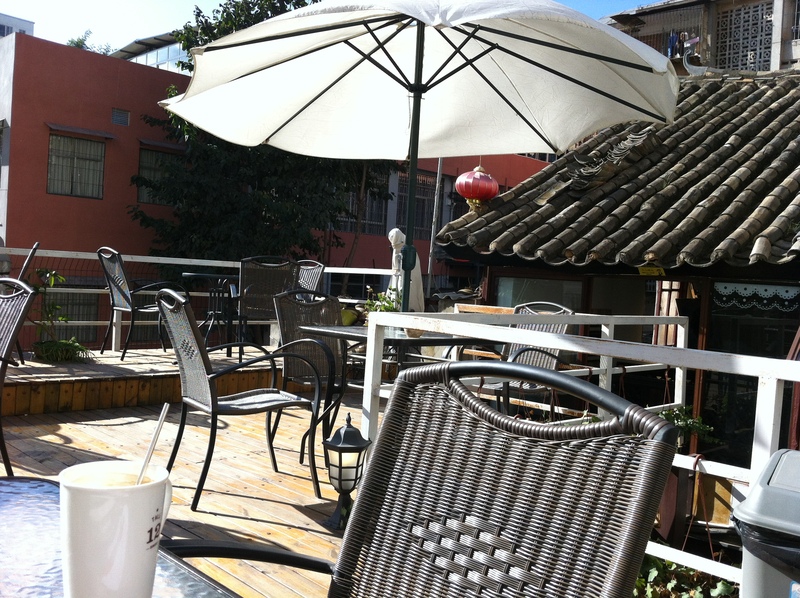 Kunming has beautiful blue skies all the time– no special reason necessary. 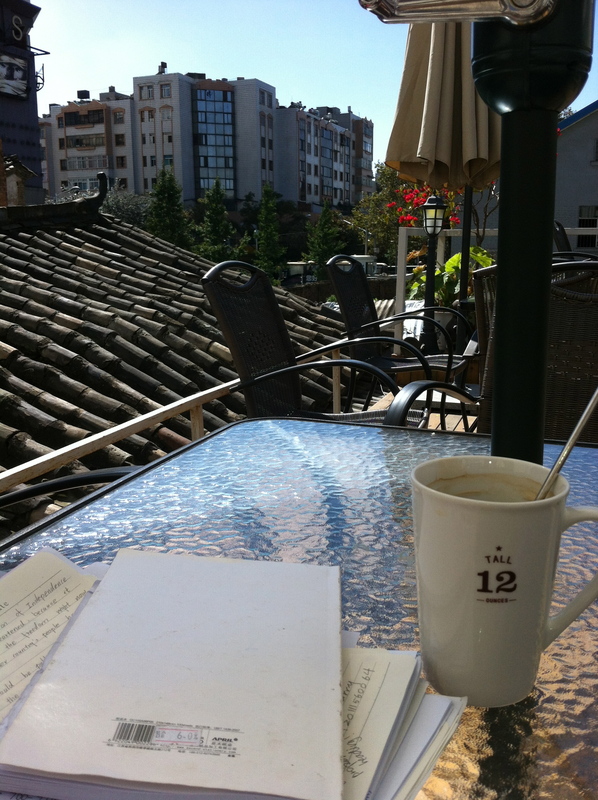 As for the coffee, it is on the expensive side, but so priced similar to pretty much every coffee shop on this street. I will gladly pay for a little peace and quiet in this chaotic city. Looks like a great spot, I don’t blame you! If you want company, but don’t want them to know where it is, maybe you could blindfold them when taking them there.